Dairy Processing Industrial Fans & Blowers | AirPro Fan & Blower Co.
Industrial exhaust fans are used to move and recycle clean, fresh air in dairy processing. 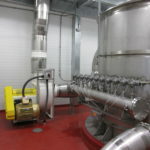 Industrial blowers are also used on the drying and processing systems that produce cheese, whey, and other dairy by-products. AirPro builds clean, efficient, food-safe fans for any dairy application. VFDs, silencers, hoods, screens and other accessories are available.